CFD trades can be executed with the investor only having to lay out a fraction of the total face value of the trade. This is known as trading on margin and the CFD broker borrows the remaining fraction of the value of the position to the investor. Suppose a CFD provider offers 15% margin and you have a good set-up for a trade. You want to trade £10,000 worth of the asset to make a decent return. In this case, you would only have to pay £1,500 to open the position. The CFD provider will borrow the remaining £8,500 to the investor. The margin is used to guarantee that the contract is honoured by the investor. Risk and the full price of the investment a CFD contract offers are two important factors that determine the margin set by CFD brokers. In the example above, the margin is £1,500 and this is the minimum amount needed in the trading account to let the CFD broker allows the investor to trade. Initial margin is the amount needed to enter a new position or new trade and is usually a set percentage of the value of the contract being traded. When the contract is exited, the initial margin is returned. In this case, £1,500 is the set level which should cover any potential losses on the position between business days. CFDs are traded on margin and there are two different forms of margin that may be payable when trading CFDs – Initial and Variation Margin. When you trade Contracts for Difference (CFDs), you can take a position in an asset which is more than the money you have available. This is called leveraging or gearing your money. However, you will need to have a certain amount in your account to be able to open the position, and this is called the initial margin. The initial margin is in fact a deposit used as collateral to open a CFD position. The margin is held to ensure you can meet your obligations. CFDs are quite a popular tool for day traders, as you can gain market exposure with low costs per trade and trading CFDs has a built-in gearing effect (usually the trades are based on a margin of between 5% and 20% of the stock value being traded). The margin rate is usually expressed as a percentage and is calculated based on the liquidity and volatility of the underlying security. 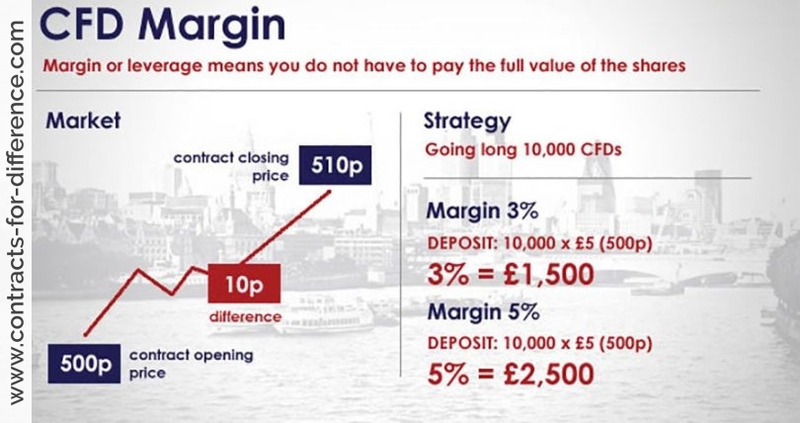 The initial margin is the amount required to open a position and typically varies from 3-5 per cent for the large, liquid stocks at the top end of the market or index, to up to 80 per cent for the smaller, less liquid stocks at the bottom end of a market or index. 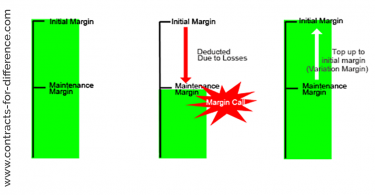 Margins are charged to cover the CFD provider if the price moves dramatically against the client’s initial position. Margin amounts are deposited back into the client’s account as and when trades are closed out. In return for being able to trade on this minimum margin (Initial Margin), the CFD provider charges interest on the full face value of the underlying position. Interest is calculated daily on all long positions held overnight. Similarly, interest is paid on the face value of any short positions held overnight. This interest charge is normally calculated at the overnight cash rate (or a similar benchmark) plus or minus a set percentage as determined by the CFD provider. This is known as a haircut or edge. 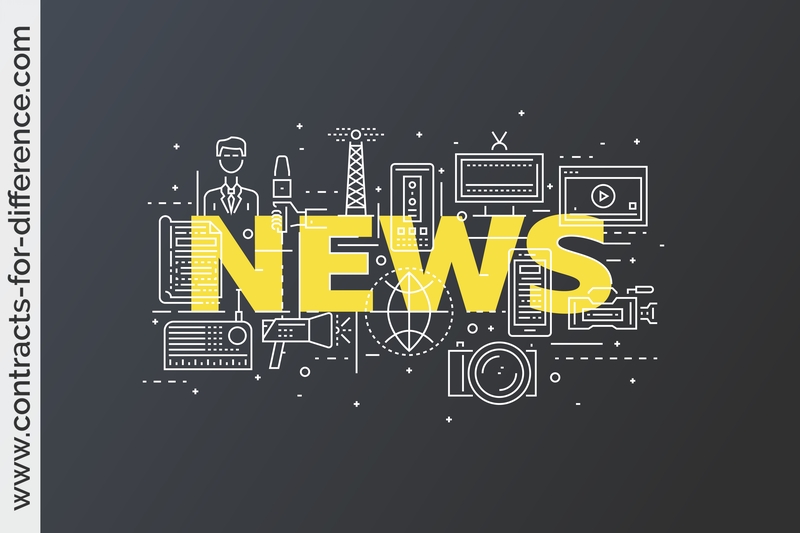 CFD providers make a profit from these haircut additions to the interest cost. CFD commissions or brokerage rates on trades are charged on a percentage of the size of the face value of the trade. These apply to both the entry side and the exit side of the trade. They are, however usually significantly less than commissions charged by traditional equity brokers. The CFD broker will set different rates for the initial margin depending on the risk that is perceived. This means that different brokers may charge different percentages for the same trader, so it pays to shop around. The broker may take your financial profile and experience into account when setting the levels, and some brokers will have different ideas of the riskiness of the various financial securities that you can trade CFDs on. You will usually find a margin of about 10% charged on stocks or even 5% on blue chips, whereas indices, which are regarded as more stable, may only need 1 or 2%. Rates also vary on other tradable assets, and the broker who has a competitive rate on stocks may not give such a good deal on commodities. The fact that you are trading on and using margin means that you can lose more than your initial deposit. This is the nature of derivatives, and CFDs in particular, and it is the reason that CFDs are so efficient at creating profit for the astute trader. If you consider that you might have to put a 10% initial margin down on a typical stock, then an increase of just 5% in the stock price would give you a 50% return on your trade (less costs). On the other hand, a 5% decrease in stock price would result in you halving your initial deposit and your broker would issue a margin call for you to deposit more funds to protect his position. Leverage is a powerful tool, and you must learn to use it in your favour. One item not always understood is that the initial margin is a security deposit, and not a part payment towards the value of the underlying asset. 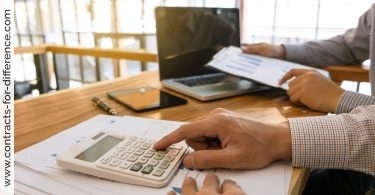 When the overnight financing costs for your trade are calculated, they are usually based on the full value of the asset, with no allowance for the initial deposit that you have put down. While a low initial deposit can allow you to take on larger trades with the same amount of money, you should always assess for yourself the possible losses, and make sure that you trade within your limits. It is quite possible for you to lose more on your trade than the initial deposit, particularly if the deposit is small, and a risk assessment will tell you how deeply you should go into the trade, given the overall size of your trading account. Just because you can trade more, does not mean that you always should.